We are offering this historic and beautifully engraved Stock Certificate issued by The North Central Republic Airlines Company dated 1979. 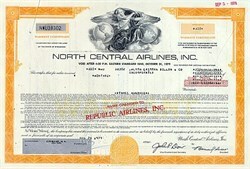 The certificate was issued by North Central Airlines, but the name was changed and stamped on the certificate Name Changed to Republic Airlines. North Central Airlines began operations as Wisconsin Central Airlines in 1948. The airline changed its name to North Central Airlines when it relocated its headquarters to Minneapolis/St. Paul in 1952. Republic Airlines was the product of a 1979 merger of North Central Airlines and Southern Airways, and the 1980 purchase of Hughes Airwest. In 1986, Republic Airlines was acquired by Northwest Airlines in a merger. This document has a nice ornate orange border around it with a great vignette of an Allegorical Woman With two globes on her sides. This document is in excellent condition.